The opening day of the project was a chance to meet the women who would be engaging in the workshop over the forthcoming week and to introduce them to the project and discuss its aims. As a way of doing this practically, a series of tasks were devised to help distract them from their usual routines of making and to sensitise them to alternative colour and pattern possibilities which could be adapted for use within their craft. 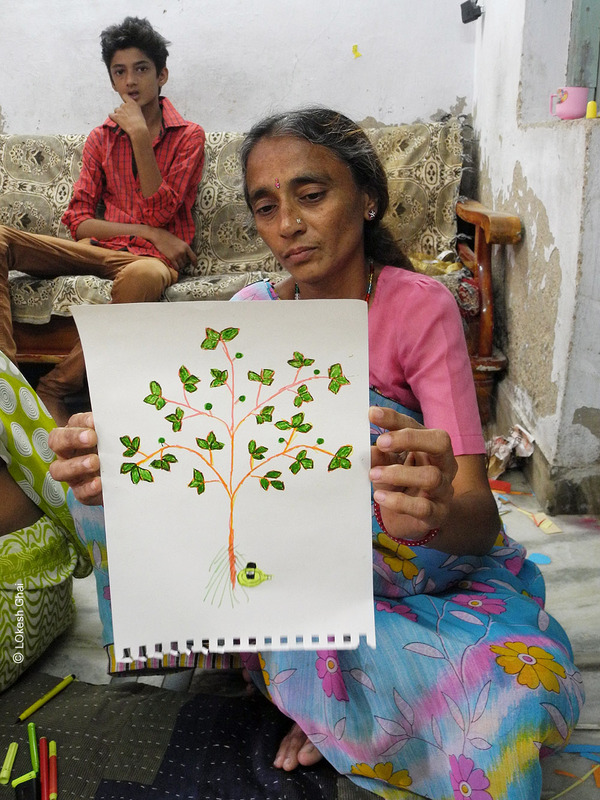 To start the day’s activities off, the women involved demonstrated their handicraft and skills by showing LOkesh, Emma and the rest of the group their past quilts and samples of previous work they had done for various clients. 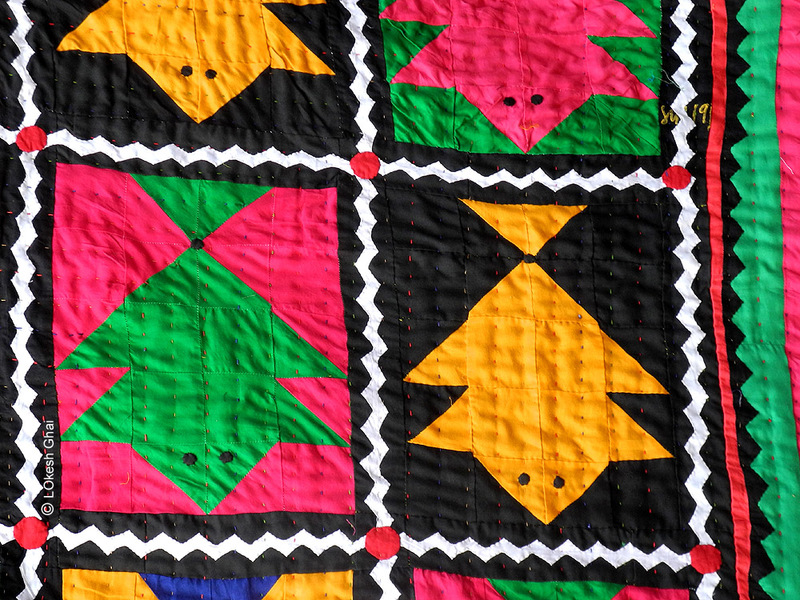 Some of the quilts were over 30 years old and had been made by their mothers for the family household, while others were new designs made from recycled clothing as additions to their own family’s household needs. In preparation for the workshop Emma and LOkesh had devised a series of activities to help the group explore new colour and pattern possibilities away from their craft’s traditional designs. The first activity concentrated on colour interaction. 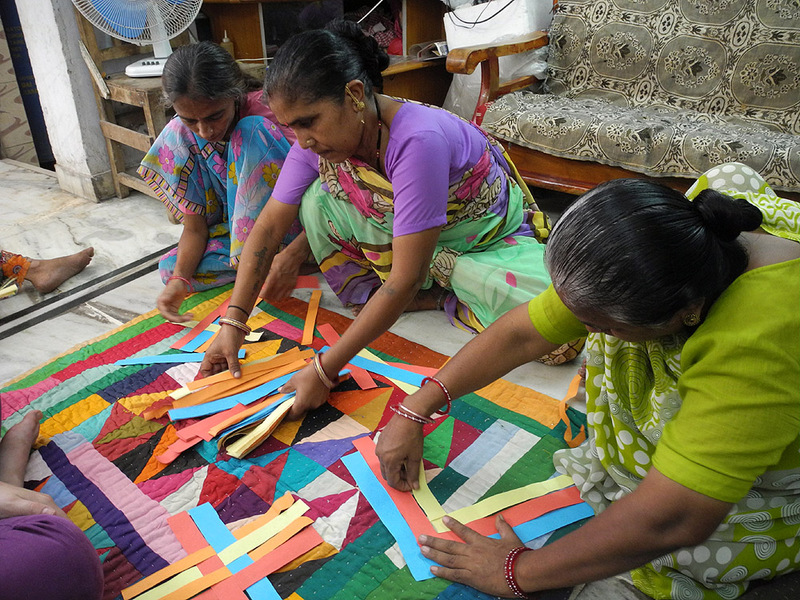 Emma purchased some coloured handmade paper from the Kalamkush paper factory and had cut the paper into strips of various widths ready for the women to weave together in various combinations. All of the group’s members took a very different approach to the task than the one that had been considered and the product of the session was a multiplicity of designs and colour combinations stuck together with packing tape and glue. Numerous members reached for the uncut pieces of paper on which they stuck the strips to make new and unique patterns. The resulting designs all proof of the participant’s inner creativity and design consciousness waiting to be engaged with creative and innovative tasks. For the second activity the group were invited to draw something from around the house that they found interesting or had a fondness of, but using no pencils or black pens, only coloured highlighters, pencils and felt-pens. At first the group seemed a little shy and with lots of giggling and awkward shuffling making it apparent how much this task was moving them away from their usual working practice. To ease them into the task, Emma began to draw which helped to alleviate the group’s anxiety and soon they were drawing numerous objects situated around the household. It was interesting to see how Visali drew so accurately with her ruler and pencil and how Jamnaben eventually admitted that this was the first time in her life that she had ever drawn while Kuverben was much more settled with the activity having been an avid drawer in her youth. 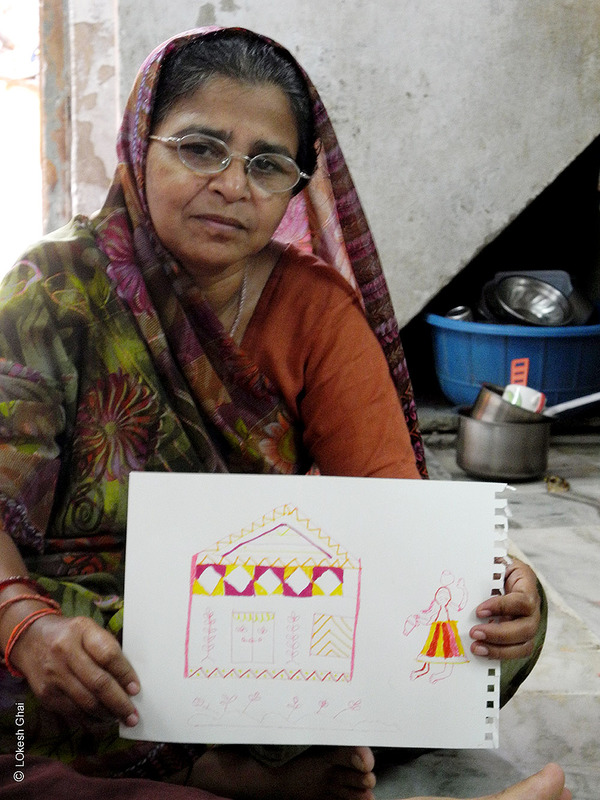 After taking them away from their traditional methods of working, the group returned to fabrics, cottons and needles. In order to reflect on their tradition, the group made samplers of the traditional designs they regularly used in their craft from which a ‘dictionary’ of designs could later be formed. 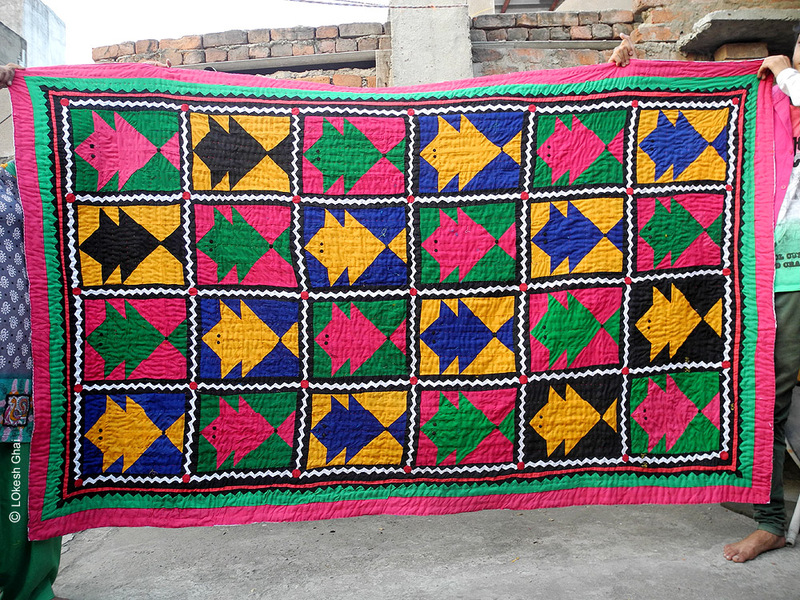 Very quickly, small sampler squares of various different designs, including stars, kites and chocolates were appearing, the group constantly seeking approval of their work from both Emma and LOkesh. Most of the group didn’t use rulers to measure and instead used fingers to work out the sizes of the pieces of fabric they needed. Whether it was the presence of LOkesh and Emma or the previous assignments they had been faced with, there was a large amount of consideration of colour combinations and conferring between the group before they started work on their chosen design; something which demonstrated the supportive ethic of the group and the surrounding community. 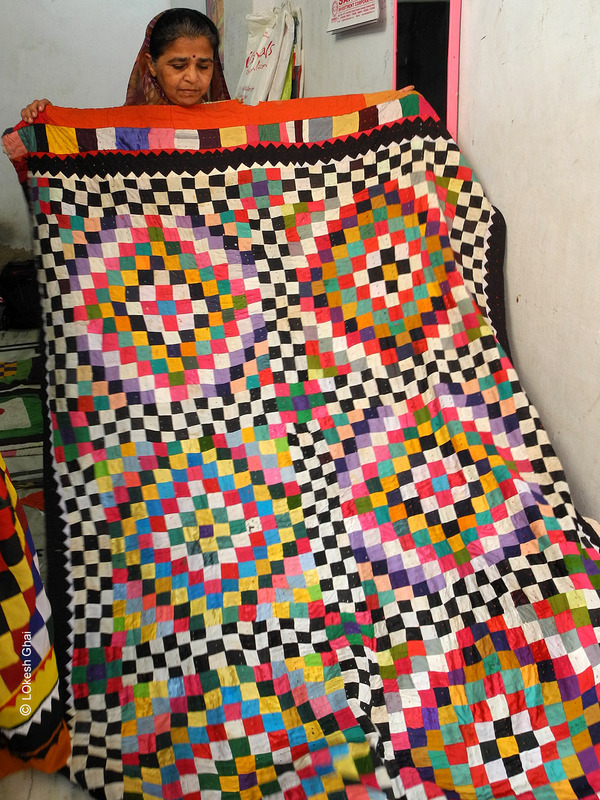 This entry was posted in Uncategorized and tagged Ahmedabad, Craft, India, katab, quilts, Traditional Artisan by emmaandlokesh. Bookmark the permalink.